Barramundi Perch is a variety of tropical fish that comes from the Latidae family. This is both a farmed and wild-caught fish variety, which is caught by making use of gill nets in fresh and coastal waters in the tropical north of Australia, ranging from the Western Australia Ashburton River to the Queensland Noosa River. These fish varieties inhabit in creeks, rivers, coastal shallows and estuaries, but they all move into coastal shallows and estuaries to breed. Farms situated beyond South Barramundi that naturally crop up, use warm salty bore water to imitate the natural habitat of the fish. Nearly all farms use salt water, rather than fresh water. Usually, the Barramundi Perch fish prefer the water temperature, ranging from 26 degree Centigrade to 29 degree Centigrade. The Barramundi Perch fish breed is an average-sized fish, with a body length of 60 centimeters. Usually, the male breeds attain maturity after 3 years of their birth, and will turn to female after 5 years. They can attain the maximum body length of 1.5m, with the weight of 50kg when matured. Barramundi Perch fish breeds are extreme cannibalistic, and they feed on mollusks, crustaceans and smaller fish in the wild. In the captive, these fish varieties are fed with high levels of digestible fat and protein foods. Reproduction in Barramundi Perch fish breeds starts during the monsoon. Peak reproduction periods are during the nighttime from November to December and from February to March and nights subsequent to full and new moon nights are the occasions of maximum spawning activities. The male breeds start to migrate downriver to meet female breeds and to fertilize the extremely huge number of eggs laid by the female fish. The eggs and larvae of this fish variety survive only in salt water and brackish, with salinities, ranging from 22 promille to 40 promille. 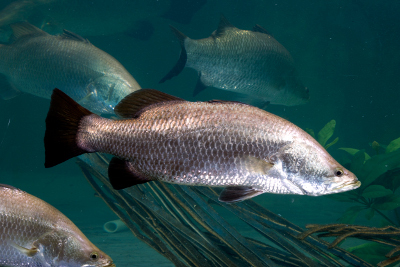 The lifespan of the Barramundi Perch fish breed ranges from 16 years to 20 years.